I thought I would start a regular post once a month highlighting some of our kids and how we provide intervention. I post this hoping it might give some treatment ideas to clinicians. There are many ways to treat feeding and swallowing difficulty so my intention is not to promote a certain technique or method but only to provide ideas and generate good discussion. History: E.G. , 5 year old with genetic disorder, global developmental delay, scoliosis, and very poor weight gain. Feeding problems include: oral motor delay (emerging chewing pattern but some difficulty with bolus formation and transfer, weak biting, delayed oral transfer pattern, and inconsistent intake). E.G. was consuming an average 4 oz of soft solids at meal time and his g-tube was not being used consistently. Feeding: Caregivers brought canned pasta which was heated. Grandmother fed pt and he accepted bites with good opening and lip clearance of the spoon. pt used lateral biting and chewing with some tongue mashing. pt had a slow oral manipulation pattern with reduced bolus formation. When Grandmother offered the next bite, E.G. still had food in his mouth. He required extra time to chew and swallow each bite. This occurred repeatedly for 5 bites. There were no s/s of swallowing difficulty. It appeared that E.G. was having difficulty completing his meal due to weak oral skills and prolonged oral phase which was contributing to his poor weight gain. His food consistency was too difficult for him to manage efficiently to take the calories he needed to grow. Therapeutic Intervention: Our team decided to puree E.G.’s food to determine if eating was easier and more efficient. We demonstrated how to make a home made puree in the clinic room. E.G.’s canned pasta was put into a vitamix blender. The pasta was blended into a smooth thick homemade puree. Grandmother resumed feeding and E.G. also participated in self feeding a few bites. E.G. had improved bolus formation and timely oral transfer and accepted 9 oz of puree in 15 minutes. Family was surprised and happy that E.G. was able to consume more volume easily. 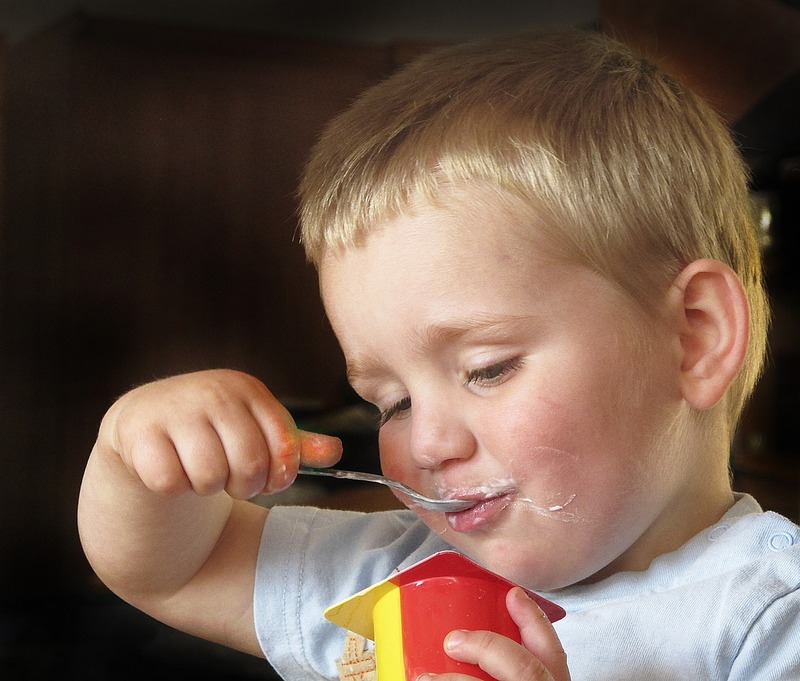 Plan: A plan was put into place to offer/feed E.G.homemade purees at meal time followed by chewable solids. Supplemental tube feeds will be used to improve nutritional status and weight gain. Arrangements were made to assist family in obtaining a blender. Therapeutic program was put into place to work toward improved chewing. remained a non-oral feeder until decannulation. S.P was referred to the feeding team at age 6 1/2. A swallow study cleared S.P. for puree consistency and he had been accepting 4 oz of applesauce one time per day at home for several months and 4 oz of a fruit puree at school for 1 month with G-tube feeds for main nutrition. Feeding: Before the puree feeding, Speech assessed swallow with liquids. Speech administered 5 sips of water via reflo cup. This cup was chosen to control the flow and water was administered because it is the safest to aspirate during clinical trials. S.P accepted the sips easily with reduced bolus control as evidenced by oral spill. ST palpated S.P.’s laryngeal elevation which felt reduced. S.P did not have coughing, choking, or obvious signs of aspiration but is at risk due to history of airway reconstruction and lengthy period of non-oral feeding. It is noted that S.P. has good handling of secretions and does not have a significant pulmonary history, all positive indications for being an oral feeder. Mother was observed feeding bites of stage 2 puree. S.P opened well to accept the bites with good bolus formation and transfer. Speech discussed expanding S.P.’s acceptance of flavor and food groups. Speech introduced a new flavor, pureed bananas which S.P. accepted easily. He accepted 6 oz of puree during the feeding with mild refusal but accepted with verbal prompt. Plan: Plan is to increase oral feeds of puree to 3x/day, expand variety with 2 flavors offered at each feeding and to incorporate home made purees. Family will practice water swallows before puree in preparation for a repeat swallow study. The first test had been done when S.P had not had a lot of experience eating and he had demonstrated significant refusal behaviors making a full study difficult. Now S.P has been eating for several months and should be able to complete a study with liquids. History: C.B., 2 1/2 year old typically developing child with long history of feeding refusal/oral aversion, oral motor delay with sucking pattern with emerging chewing, good weight, but also asthma and frequent respiratory illnesses including pneumonia. C.B. also has a history of aspiration of thin liquids on previous swallow study and was cleared for 1/2 nectar consistency. 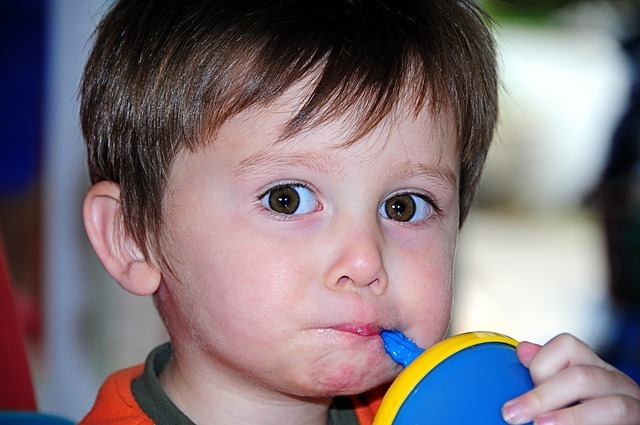 He refuses to drink milk or supplement thickened but will drink juice thickened. C.B. will drink Pediasure Peptide in replace of some meals and is given this when he refuses to eat. Team had treated C.B. with periactin (or cyproheptidine, appetite stimulant) in the past with improved intake, however, over the last 3 months, C.B. had refused to eat with significant irritability, weight loss, and was eating very little at home. At the last team visit, 4 weeks earlier, GI stopped the periactin and started a prevacid solutab in the morning. This has resulted in improved eating and oral intake. Feeding: C.B. was placed in a high chair. He willingly self fed cereal in milk via spoon. C.B self fed very large bites and required cueing to take smaller more appropriate bites. C.B. demonstrated intermittent chewing with sucking/tongue mashing pattern. He consumed about 4 oz of the softened cereal with milk with 3 episodes of cough with swallow. He then self fed 10 bites of dry cereal. He responded well to lateral placement of solids, visual and verbal cues to chew. A chewy tube was presented but he had strong refusal to bite on this. Plan: C.B. is being referred to pulmonary for frequent respiratory illnesses and asthma symptoms. ST encouraged thickening of liquids and suggested adding a scoop of vanilla yogurt to milk or the cereal to thicken. A repeat swallow will be completed after 6-8 weeks on reflux medication to determine if swallowing function improves. If it does not, C.B. will also be referred to ENT for structural evaluation of his larynx. For feeding, ST recommended offering meals and snacks at the table and to eliminate grazing behavior to stimulate hunger at meal time. Meals should consist of 1 easy food such as a puree or mashed soft solid with chewables. Encourage C.B. to self feed and caregivers were encouraged to assist in feeding and offering bites. If offering a supplement, offer 4 oz volumes to prevent C.B. from filling up. GI will consider restarting periactin now that C.B is showing improved comfort on GERD meds to stimulate hunger. Therapy plan for oral motor delay to work on chewing was provided. History: D.G., 5 year old with achondroplasia, history of feeding difficulty as an infant and toddler with former g-tube feeding and oral more delay but had been discharged as an oral feeding at age 3. D.G. returned to the feeding team with poor chewing of meats. Feeding: Mother provided a meal of diced chicken, grapes, crackers, and pasta. D.G. self fed and demonstrated ability to use a rotary chewing pattern with chicken pieces and all foods offered. D.G. was able to bite on both sides using good strength with lateral transfer. She swallowed bites well at first. After approximately 10 bites, D.G. began to show a dry cough following the swallow of solids. She coughed > 15x during the feeding which mother described as typical. When asked if she was having trouble swallowing, D.G. pointed to her throat and said “it’s stuck”. Plan: The differential diagnosis for solid food dysphagia is poor chewing vs. upper airway obstruction vs reflux vs. eosinophilic esophagitis. D.G.’s chewing appeared functional although she appeared to have a small oral cavity and could possibly have a narrow pharynx or inflammation making the swallowing of solids difficult. GI will treat for reflux and a swallow study was ordered. Team recommended meals of soft solids and to dice harder to chew foods at this time. Liquid swallows may assist in clearance. If there is no improvement and after swallow study results are obtained, D.G. may benefit from further testing such as an UGI endoscopy to rule out an allergic esophagus. Both Vitamix and Blendtec have charity programs to help families in need obtain a blender. We are very lucky to be one of their hospital sites which enables our feeding team to assist families who need a blender either for homemade tube feedings or for children who need prolonged oral feedings of puree. Here is a post about Vitamix’s charity program http://pediatricfeedingnews.com/?s=vitamix . I really appreciated reading the treatment approaches with the case studies. It was a variety of conditions and oral motor skilllevels were presented. Fabulous post!! Thank you. Please keep these coming. What an awesome resource. I was just wondering if in the treatment plans, did you include or do any type of jaw/lip work or oral massage techniques? Sorry for this delayed reply, I do use Beckman exercises with many of the children I work with depending on the needs of the child and underlying oral motor issues. For some children, I see improvement in the oral patterns with the practice of eating and I may not do any oral work and others benefit from that type or work before the feeding. Case by case. Krisi, THANK YOU SO MUCH for these case studies. They provide such practical hands-on strategies that can be immediately applied with kiddos who may look similar. I really appreciate the information you so graciously share with the SLP community.